TURIN, Italy — If you're looking for Sergio Marchionne in the next few weeks, you might try the men's room — at any one of Chrysler's plants, offices or technical centers in the United States. The Fiat S.p.A. CEO regards the state of the bathrooms as an excellent gauge of a company's condition and morale. On his first visit to Fiat's Mirafiori plant here a few years ago, for example, Marchionne was disgusted by the employee showers and restrooms. "The conditions were absolutely prewar," he said at the time. "I ordered them to be renovated." It's an example of the 56-year-old Marchionne's attention to detail and desire to see things firsthand. "Over the coming weeks and months, I will be spending a great deal of time meeting with Chrysler employees and touring its facilities," Marchionne said last week. The Italian-Canadian turnaround specialist used the same approach when he was called in to rescue Fiat from the brink of bankruptcy in June 2004. For about 45 days, he toured Fiat plants and offices worldwide, getting to know the company and its people. Marchionne has not said whether he will become CEO of the new Chrysler or just an active board member. Fiat will choose three members of Chrysler's new nine-member board, two of which will be independent. He has said he could take over as chief executive, but either way there is no doubt who will call the shots. "I don't care about titles," Marchionne told a group of analysts last month. "What is important to me is they listen to me." Chrysler CEO Bob Nardelli said last week he will step aside after the company emerges from Chapter 11, and co-President Tom LaSorda will retire before then. Nardelli, 61, came to Chrysler in August 2007 after Cerberus Capital Management took an 80.1 percent stake in the automaker. He replaced LaSorda, who said last week that he likely will retire within 60 days. A Fiat insider said Marchionne has not formulated a management team and won't necessarily install executives from Italy. He did not bring lieutenants from SGS Group, the Swiss inspections, auditing and certification services company where he was CEO before joining Fiat. Instead, he got to know the local talent pool. 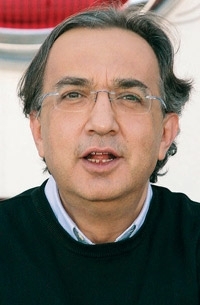 "One late afternoon in late 2004 Marchionne entered my office, introduced himself and asked me who I was and what I was doing," former Fiat executive Luca De Meo told Automotive News in 2006. The two men spoke for a couple of hours — mainly De Meo replying to Marchionne's wide-ranging questions. Soon after that meeting, De Meo was promoted from head of marketing at Lancia to CEO of the brand. Marchionne is expected to get to know Chrysler people in much the same way. But some Fiat executives could find their way to Chrysler. In the past five years, Marchionne has moved about 60 Fiat Group executives to the United States for stints at Case New Holland, the suburban Chicago farm and construction equipment maker that Fiat owns. The idea was to train them in a U.S. working environment. One Italian candidate for a top Chrysler job is Alfredo Altavilla, who is the co-architect of the alliance along with Marchionne. Altavilla, 45, is both CEO of Fiat Powertrain Technologies and head of business development for Fiat Group Automobiles. He is considered a rising star in the Fiat group, but sources last week said he will remain based in Turin.